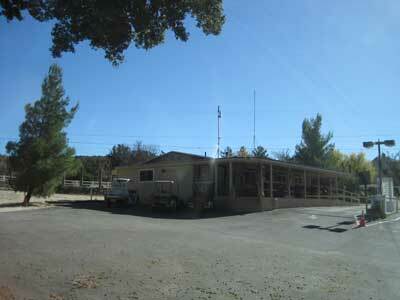 Length of Trail: There are miles of trails from this equestrian campsite. There is a 2 mile loop dirt trail around the 163 acre facility and access to miles of trails on the Campo Indian Reservation. Equestrian Camp Ground: There is a primitive campground for horse and group camping to the east of the main campground. 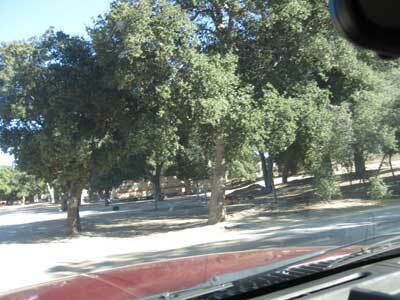 You can bring your Rv., or tent and camp under large ancient oak trees. There is access to water. They request that you bring your own containment and only permit weed-free/seed-free feed. There is a large horse arena, but no corrals. 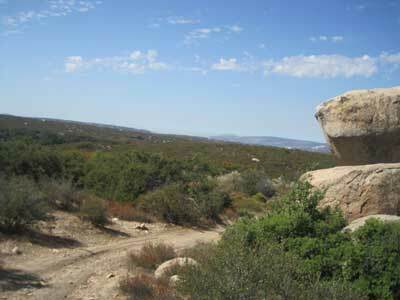 “There are several miles of hiking trails in the 163 acres of Sacred Rocks Reserve. You could spend 1-2 hours and hike just the perimeter, or you could criss-cross the reserve and make your own discoveries. Leaving the campground, the trails head upwards in a gentle climb toward the north property line. The path follows the fence line all the way to the east line of the Reserve. North, beyond the fence is 260 acres of BLM land that you can also hike. On the ridgeline you have a panoramic view of Southern California high country. You can see houses dotting the hills around, from San Diego County to Imperial County. You see outcroppings of huge boulders both over Sacred Rocks Reserve, as well as over the hills around”. Trail Users: The trail is open to hikers, cyclists, as well as horseback riders. Dogs are also welcome on a leash. General Trail Info: Check out the website: sacredrocksreserve.com. This is an established 163 acre reserve with a full campground hookups, which has just opened to equestrian camping. The facilities include a swimming pool, hot tub and clubhouse. There are horseshoe pits, a labyrinth, drum circle and stargazer plateau. There is a private Artist’s Colony with year round residents. The facility has an onsite manager, a store and laundry facilities. Free Wi-Fi.